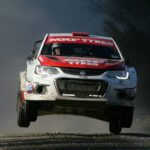 The Grey Roots Group today published their 13th annual rankings of the nation’s fastest rally drivers. 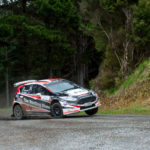 However, in a break from previous years, they have included overseas drivers who have competed on New Zealand soil during 2018. Group spokesperson Tracy Spark explains the reason for the change. 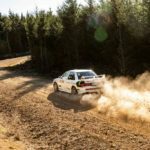 “We have seen a real upsurge in interest from offshore drivers with what..
Queenstown’s Mike Sheehan heads to the final round of the Brian Green Property Group New Zealand Rally Championship, the Hyundai NZ Raglan Rally of the Coast, looking to continue the learning curve that has been his first season in the national championship. 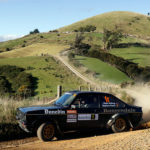 The Raglan based event makes use of roads made famous when the World Rally Championship visited New Zealand,..
Gore driver Andrew Graves, in his Mitsubishi EVO 3, continued his phenomenal run of success when he won the 2018 Rankleburn Rally in West Otago on Saturday. 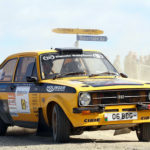 Graves completed the event, which he also won in 2012 and 2014, with a 28 second margin over Job Quantock of Ohoka in a Skoda Fabia AP4 with Oamaru driver Scott Simpson (Volkswagen..
One of New Zealand’s top rally aces, Josh Marston of Christchurch, has entered the Eastern Southland Car Club’s Rankleburn Rally in West Otago on Saturday 6 October. 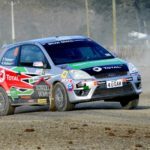 Marston, currently third in the NZ Rally Championship driver standings with one round remaining, will bring his Holden Barina AP4 to the event which is supported by MLT / Heartland Hotels /Ernslaw One..
Four stages wins……..and a ‘Shakey’ start!! Mike Young reports on Rally Hokkaido Well what a start to our Hokkaido Rally trip! We left a week early to have a good look around Hokkaido before travelling to Obihiro for the rally. During our first night in Japan, Hokkaido experienced one of their worst earthquakes. What a welcome to Japan and thankfully we were all safe, but stuck..
Tauranga’s Phil Campbell has continued his impressive run in his new car with a close fought second place at the Far North Rally over the weekend. 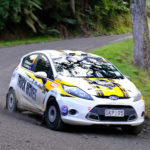 After an encouraging sixth place at the recent Rally Coromandel, Campbell and the team entered the Paihia-based event to continue to learn and develop the new The Roofing Store Ford Fiesta AP4+ on an..
Next year’s Otago Rally will offer competitors a two-pass reconnaissance for the first time, in a move to reduce the advantage of drivers who have contested the event on many occasions. 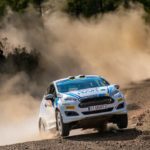 The decision is not one that has been made lightly by rally organisers, and is the first of many new features that will ensure that the Otago Rally remains..
New Zealanders Dave Holder and Jason Farmer have finished Rally Turkey, their final event of their debut FIA Junior World Rally Championship season, with two stage wins, the honour of being the fastest JWRC crew for Sunday, and a seventh-place finish in their class for the rally. Of Sunday’s very encouraging results, Holder says: “It was a pretty successful day..